Easily custom-crop a lot of photos. This little application lets you easily crop photos for use as tiles in PictureMedley or for printing. Whether you have a 4x6 or 5x7 photo printer or you upload images to a photo printer (either web site or local printing service), take control of the parts of the image that get trimmed away by cropping the image yourself before printing. The PictureMedley application imports a large number of images and automatically trims away parts of the images in order to fit them into the mosaic. In generating medleys containing people's faces, I like to have the faces fill as much of each tile as possible. Since the subject isn't necessarily in the center of the frame the resulting mosaic tiles have imagery that is too small. With Cropper I can "process" a large number of photos in a short amount of time, extracting exactly the parts of each photo that I want to appear in the final mosaic. Use "tags" that you can easily customize to assign simple keywords to the filenames of your picture files (both originals and crops). Tihs is a fast since the photo file never has to be read into memory. Now while you're reviewing the photos fresh from your camera you can rotate the pictures as you go. Image rotation is done using a "lossless" approach where possible, which means that the picture does not need to be re-compressed (which would result in a loss of picture quality). Cropper works well to recompose your photos quickly for the scrapbook layout you're working on. Read more about that here. Use your mouse or stylus to drag a rectangle in the photo area. Reposition the rectangle if you wish. Click the Save icon. You'll see an hourglass while the program is doing its work. When the rectangle turns green, it's finished saving. Look in the directory you dragged the image from. You should find a file called something like "DSC0363(Flowers)(1x1)1.jpg"
That's it. Upload the generated file to your favorite printing service or your photo printer, or use them with PhotoMosaic. After installing the program, you'll find it in the Start menu, under All Programs. Once it's up on the screen you'll see a big gray box with the text "Drop a photo here to get started." You can use your mouse to drag an image file into the application window. Once you have a photo loaded, use your mouse to drag a rectangle around the part of the image you want to focus on in your cropped photo. Use the left mouse button to draw the rectangle from corner to corner, or use the right mouse button to draw the rectangle from the center outward. bring images or folders of images into Cropper by dragging from Explorer using mouse, pen, or touch. 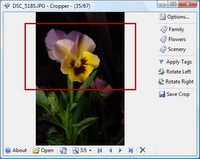 Save the selected area to a crop file using the space or enter keys, or by double-clicking within the crop area. The original images are untouched. Nothing is overwritten. The program is designed to leave the original image unmodified. (with the exception of rotating the image of course!). Each area you crop from the image goes into a new file and its name is automatically incremented so that you don't have to worry about coming up with a unique file name. Applying tags to the original file will rename the file. This is a pretty benign operation. I'm in the habit of managing or categorizing my images using shortcuts rather than copies of the images. The main benefits of this approach are that I save disk space, and I avoid worrying about whether an image I find in a folder on my system is the original or not (because the image is a shortcut). This software, like most of the apps on Photility, is compatible with this approach, allowing you to drag a shortcut to an image, or the image itself, into the application window to get started. Added a Delete button to the bottom toolbar. I found in my photo processing I had several photos that weren't worth keeping, and it was becoming tedious switching back and forth between Cropper and Explorer. The Delete button removes the current image file (it goes into the Windows Recycle Bin if you should hit it by mistake). Enabled double-click on Tags. I found many photos needing only one tag, and it became tedious to click the tag and then click "apply tags" each time. Now, double-clicking the tag applies it (or removes it) immediately. Another Cropper update! I started playing with Adobe LightRoom this week, and discovered that it was a little overwhelming having all of the cropped images mixed with the original images. So I've added a new setting to put crops into a separate folder. Enter just a name (e.g. the default is "Crops") and the folder will be created inside the folder you're currently processing. For example, if you are processing pictures in "C:\Pictures\Lake Trip 2007" then crops will be saved into "C:\Pictures\Lake Trip 2007\Crops". Enter a relative path along with the name to mix the crops together. 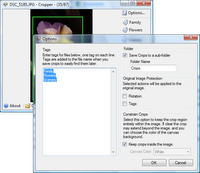 For example, if you enter "..\Crops" then in the above example the crops will be saved into "C:\Pictures\Crops". Just added a quick update to Cropper to be aware of the Exif Rotation Tag. Many digital cameras these days include a little gravity sensor that allows the camera to know which way was up at the time the picture was taken, and this information is written to a tag in the photo file. Cropper is now aware of this tag, and automatically adjusts the image when loading it. The original image no longer needs to be rotated with this ability. Responding to a couple of minor feature requests today. new option to allow the crop area to expand slightly outside the image. This allows you to squeeze more of an image into the crop as long as you're willing to live with the "letterbox" look (black or white bars on top/bottom or left/right). improved protection for your original images - you can choose to not apply rotation or tags to the original image when rotating or tagging for crops. new aspect ratios - 8x12 (technically redundant with 4x6 and 2x3 but I had a little space on the screen to fill up...) and freeform. shortcut for tagging crops as you make them - if the option for applying tags to the original file is off, you can double-click the tag after selecting a crop area and the crop will be generated immediately with that tag in its filename. This is handy for quickly extracting images of individual faces from a group portrait. The new options are available in the updated Options UI! Click the Options button to get there. Here's a peek. The expanded crop area behavior is especially handy if you're ordering prints and want to make sure the interesting parts of the picture are included in the print. Of course you can stick with the current behavior where the crop area will stay inside the image. We don't always want those letterboxes after all... Just select that "keep the crops inside the image" checkbox on the Options screen. Here's a peek at the expanded crop area. When the crop is saved, the image will have black or white bars on the sides (depending on what was chosen in the option dialog--I chose black because the background of the flower photo is black). I went with just black and white for the letterbox effect - let me know if you would like other color options (drop me email or hit the comment link). Cropper runs on Windows computers from Windows XP to Windows 10. If you have a Mac, you can use software like Parallels or Boot Camp to create a Windows environment, and Cropper will run fine on your Mac.